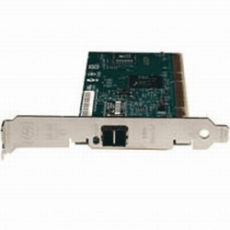 The HP NC310F PCI-X Gigabit Server Adapter is a single port 1000SX fiber-optic adapter option with 133 MHz PCI-X bus technology. Standard feature support included with NC310F consists of network failover and load balancing PCI hot plug capability jumbo frames dual address cycles (DAC) TCP offload capability pre-boot execution environment (PXE) and more. The NC310F also supports optional ProLiant Essentials Intelligent Networking Pack that proactively adapts to changes in the network infrastructure.